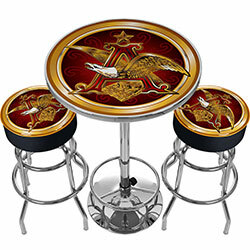 This Officially Licensed A & Eagle Game Room Set includes one Pub Table and Two Barstools. The bar stools are very high quality stools with a comfortable padded seat that swivels 360 degrees. The Pub table features an acrylic top with crystal clear reverse side printing. The 1 inch thick solid wood top and full chrome base with foot rest makes this a heavy durable unit.